OKW Electronics has extended its wide range of DIN rail enclosures with ventilated models ranging from 1 to 12 modules (standard height 90 mm, depth 58 mm). Typical applications include automation, building and safety technology, heating and air conditioning systems, sensors, timers and lighting controls. OKW’s DIN rail boxes are designed for EN 60715 TH35 rails but can also be fitted to TH15 or G32 rails with an adaptor available as an accessory. These tried and trusted snap-together enclosures are molded in robust flame-resistant (UL 94 V-0) polycarbonate (PC). There are five possible positions for mounting the PCBs thanks to screw pillars in the base plus vertical and horizontal guides in the top. Circuit boards can be terminated on one or both sides of the enclosure. 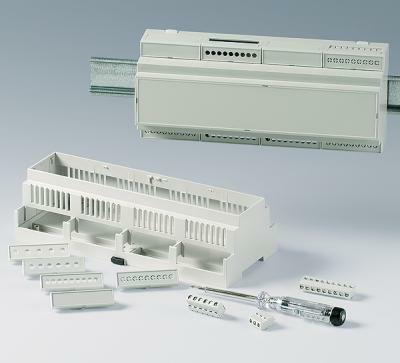 Four versions of the DIN rail enclosures are available. Version 2 basic housings are open fronted and ventilated with case walls open to the inside. Versions 1 and 3 are open fronted and unvented. Version 4 is unvented and has a closed front. fixed and hinged lids in colors as above, extensions/mounting frames. All products can be specified quickly and easily using the rapid drilldown facility in the website. Users can configure their DIN rail enclosures by ordering the basic housings, terminal guards, front panels, lids and accessories separately from the individual sections. For more information about OKW Electronics components, please contact the sales team.